(PhysOrg.com) -- Three thousand kilometres beneath our feet, the Earth's solid rock gives way to the swirling liquid iron of the outer core. Three thousand kilometres beneath our feet, the Earth's solid rock - known as the mantle - gives way to the swirling liquid iron of the outer core (the ‘core-mantle boundary’). The last few hundred kilometres of the lowermost mantle is also known as D” (pronounced ‘dee-double-prime’). D” is one of the most enigmatic parts of the Earth which scientists have struggled to understand for decades; it can only be measured remotely, using seismic waves from earthquakes. Geoscientists from the University of Bristol and University College London, report this week in the journal Nature that some of the poorly understood properties of D” might be explained by a sudden softening of the main mineral which makes up the mantle, due to the enormous pressures and temperatures near the Earth’s core. By using supercomputers to make quantum mechanical simulations of the atoms which make up the mineral, the team show that a recently discovered change in its crystal structure makes it orders of magnitude weaker and therefore much easier to deform. Dr James Wookey, an author on the paper from the University of Bristol's Department of Earth Sciences, said: "This softened mineral would allow the material in the lowermost mantle to flow much more easily along the surface of the iron core - rather like toothpaste being squeezed out of a tube. This zone of flow would have a profound effect on our understanding of the dynamic processes at work at the core-mantle interface." 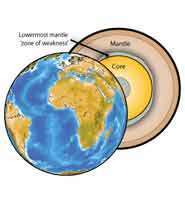 The importance of the lowermost mantle stems from its role as an interface between two titanic convection systems within the Earth. The first is the rapid churning of liquid iron in the core: the engine which drives the Earth's magnetic field. The second is the much slower overturn of the solid mantle - the driving force for plate tectonics - which forms, shakes and eventually destroys the surface on which we live. As a boundary for these convection systems, the lowermost mantle can profoundly affect their behaviour, so understanding it is vital for understanding the Earth’s long term evolution. utilizing the liquid mantle as a natural capacitor for nuclear or electrical current should be a priority to regenerative energy sources. The SUN is the engine which drives the Earth's magnetic field. If it weren't for the sun, the earth would cool and die. Our understanding of physics continues to be embarrassing.